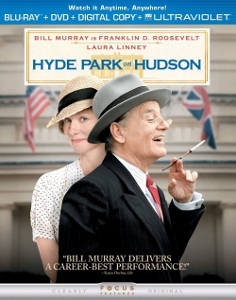 I try to never judge a book by its cover, so I didn’t think much of the rather cloying cover art on the Blu-ray cover for Hyde Park on Hudson. But after seeing this God-awful film, directed by Roger Michell (who, incidentally, directed the outstanding and underrated Changing Lanes), I realized how vividly the cover misrepresents it. 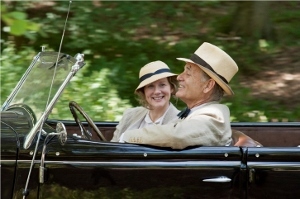 Bill Murray, as President Franklin D. Roosevelt, smiles goofily. Between his fore and middle fingers is a daintily-grasped cigarette holder. 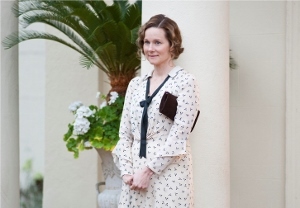 Laura Linney, as Roosevelt’s fifth or sixth cousin (“Depending on how you count,” she says at one point) Margaret Suckley, peers out from behind him with a slightly mischievous expression. That type of lighthearted playfulness might suggest a gently farcical romantic comedy. What it doesn’t do is prepare the viewer for the crushing irrelevancy of this turgid drama. After Suckley’s 1991 death (at age 99), her diaries and journals—describing her affair with the former president—were discovered. In an arguably disrespectful move (considering Suckley was deceased) these writings were adapted as a stage play by Richard Nelson. Now that play is a motion picture and the world of cinema is no better off for it. On the eve of World War II, President Roosevelt is relaxed but lonely at his country retreat in Hyde Park, New York. If the depiction is accurate, then the casual, decidedly un-presidential atmosphere is probably the most interesting aspect of the film. The year is 1939 and Roosevelt’s dress, demeanor, and surroundings are so casual it could just as well be a retirement home. Soon to visit from England are King George VI (Samuel West) and Queen Elizabeth (Olivia Colman). Franklin and wife Eleanor (Olivia Williams) are preparing to receive them and we get a taste of what feels like a distant relationship between the president and first lady. 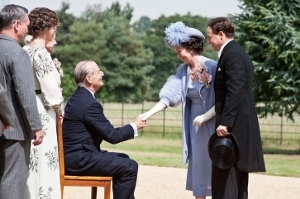 Once the king and queen are at Hyde Park, they mostly bicker, with Elizabeth complaining about perceived mistreatment. But the real focus of Hyde Park is Suckley and her relationship with Franklin. While most of it is handled with relative subtlety, their initial “date” finds the aging president putting the lover man moves on his cousin. He drives her out to a clover field, exposes his manhood to her, and silently awaits Suckley’s manual stimulation (who, in this scene only, would’ve been more appropriately named Handley). I’m no prude, but come on—was this really necessary? It sticks out like a sore thumb in a film clearly aiming for a more dignified tone. Of course, that’s one of the only scenes even worth talking about as Hyde Park spends most of its 95 minutes doing a whole lot of nothing. We never get a feel for who Suckley is as a person, nor does the wishy-washy storytelling make us the least bit curious. Linney seems lost, unable to do much to justify Suckley’s presence in FDR’s life. Murray what he can with the rather underwritten role as the esteemed president. Maybe FDR and Suckley’s relationship was indeed “special,” but screenwriter Richard Nelson and director Michell never figure out how to convey that. Much better news is that the Blu-ray looks superb. Lol Crawley’s cinematography is lush, capturing the look of upstate New York (the English countryside stands in admirably) and all its golden earth tones and vivid greens. Fine detail level is high, with even a good amount of texture and definition coming through clearly during the darkest nighttime scenes. The DTS-HD MA 5.1 soundtrack is not as noteworthy, simply because the film’s sound design doesn’t demand it to be. Dialogue and Jeremy Sams’ score are subtle and crisp throughout. Director Michell and producer Kevin Loader provide audio commentary. Michell also contributes an audio feature with “First Days,” a 14-minute narrative about the film that plays over a single still photo. There are a few deleted scenes and a short EPK promo piece. I can hardly imagine anyone craving more after watching Hyde Park on Hudson, but those are the features for anyone interested.